This study reports the purification and biochemical characterization of an extracellular neutral protease from the fungus Trichoderma harzianum. The protease (Th-Protease) was purified from the culture supernatant to homogeneity by a three-step procedure with 14.2% recovery and 9.06-fold increase in specific activity. The purified enzyme appeared as a single protein band after sodium dodecyl sulfate–polyacrylamide gel electrophoresis (SDS-PAGE) with a molecular mass of about 20 kDa. The optimum pH and temperature for the proteolytic activity were pH 7.0 and 40 °C, respectively. The enzyme was then investigated for its potential application in the production of antibacterial peptides. Interestingly, Scorpaena notata viscera protein hydrolysate prepared using the purified serine protease (Th-Protease) showed remarkable in vitro antibacterial activities. A peptide with a high antibacterial activity was further purified by a three-step procedure, and its sequence was identified as FPIGMGHGSRPA. The result of this study offers a promising alternative to produce natural antibacterial peptides from fish protein hydrolysate. This work was supported by the financial project of LIP-MB Laboratory, INSAT, Carthage University, and the Ministry of Higher Education and Scientific Research of Tunisia. De Marco, J. L., & Felix, C. R. (2002) Characterization of a protease produced by a Trichoderma harzianum isolate which controls cocoa plant witches’ broom disease. 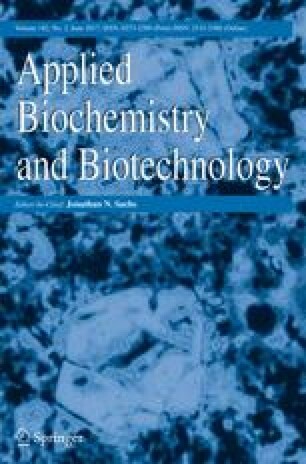 BMC Biochemistry, 3, http://www.biomedcentral.com/1471-2091/3/3.